Abstract base class for PRNG's (pseudo-random numbers generators). 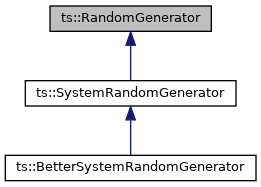 Implemented in ts::BetterSystemRandomGenerator, and ts::SystemRandomGenerator. Seed (add entropy) to the PRNG. [in] addr Address of entropy data. [in] size Size in bytes of entropy data. Check if the PRNG is ready. If not ready, it must be seeded again. True if the PRNG is ready. [out] addr Address of returned random data. [in] size Requested size in bytes of random data. The method always fill the buffer. Get random data in a byte block. The default implementation uses read(). [out] data Returned random data. [in] size Requested size in bytes of random data.